Music, Art and Diplomacy shows how a vibrant field of cultural exchange between East and West was taking place during the Cold War, which contrasts with the orthodox understanding of two divided and antithetical blocs. The series of case studies on cultural exchanges, focusing on the decades following the Second World War, cover episodes involving art, classical music, theatre, dance and film. Despite the fluctuating fortunes of diplomatic relations between East and West, there was a continuous circulation of cultural producers and products. Contributors explore the interaction of arts and politics, the role of the arts in diplomacy and the part the arts played in the development of the Cold War. Art has always shunned political borders, wavering between the guidance of individual and governmental patrons, and borderless expression. While this volume provides insight into how political players tried to harness the arts to serve their own political purposes, at the same time it is clear that the arts and artists exploited the Cold War framework to reach their own individual and professional objectives. 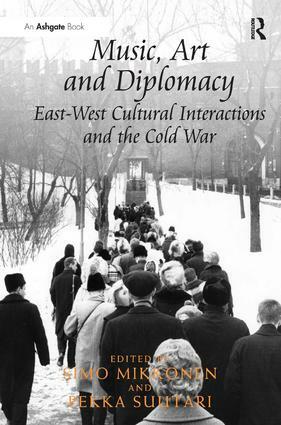 Utilizing archives available only since the collapse of the Soviet Union, the volume provides a valuable socio-cultural approach to understanding the Cold War and cultural diplomacy. Foreword, Susan E. Reid; Preface; Introduction to the logic of east-west artistic interactions, Simo Mikkonen and Pekka Suutari. Part I Indirect Contacts, Images, and Imagination: Mutually assured distinction: VOKS and artistic exchange in the early Cold War, Oliver Johnson; Friendship of the musicians: Anglo-Soviet musical exchanges 1938-1948, Pauline Fairclough and Louise Wiggins; Gazing at the Baltic: tourist discourse in the cinema of the Baltic Sea countries, Eva Näripea, Ewa Mazierska and Lars Kristensen. Part II Highly Publicised and Successful Examples of Exchange of Music and Musicians: The real ambassadors? The Cleveland Orchestra tours the Soviet Union, 1965, Clayton Koppes; Pianist Sviatoslav Richter: Soviet Union launches a ‘cultural Sputnik’ to the United States in 1960, Meri Elisabet Herrala; Student interactions, race, and the media: the Oberlin College Choir 1964 tour of the USSR and Romania, Tim Scholl. Part III Reception and Transfers in the Area of Theatre and Dance: Breaching the Iron Curtains: Russian ‘theatre tourists’ to Eastern Europe 1965-1981, Susan Costanzo; Ballet as a tool for cultural diplomacy in the Cold War: Soviet ballets in Paris and London, 1954-1968, Stéphanie Gonçalves; Conclusion, Simo Mikkonen and Pekka Suutari. Bibliography; Index. Simo Mikkonen is Research Fellow of the Academy of Finland and an adjunct professor of Russian history at the University of JyvÃ¤skylÃ¤, Finland. His primary research interests include the cultural, international and transnational relations of the Soviet Union, especially with the West. He has previously published State Composers and the Red Courtiers. Music, Ideology and Politics in the Soviet 1930s, and a number of articles in journals such as Kritika, Journal of Cold War Studies, and Journal of Scandinavian History, as well as in several edited volumes. Pekka Suutari is Professor of Cultural Studies and the Director of the Karelian Institute at the University of Eastern Finland (Joensuu). He has studied musicology (ethnomusicology) at the Universities of Helsinki and Gothenburg and he has acted as a visiting professor at the Karelian Research Centre of the Russian Academy of Sciences in Petrozavodsk, Russia. His main research interests are on the music of the borderland between Finnish and Russian Karelia and the ethnic activities of these areas. His is currently leading a joint research project 'Flexible Ethnicities' that host researchers from UEF, Joensuu, and KRC, Petrozavodsk.